SAGE Publishing has partnered with the Copyright Clearance Center for the administration of requests for permission to reuse and/or photocopy SAGE content. In most cases, requests made via RightsLink®, the Copyright Clearance Center’s automated service, can be processed immediately. You may also request permission through the Copyright Clearance Center’s website at www.copyright.com. For instructions on requesting permission, see below. Before you begin, ensure the content you wish to reuse is not credited to another source. SAGE can only grant permission for its own, original content, and any third-party material included within our publications is not included in any permission granted by SAGE. You will need to have the following information on-hand in order to proceed with your request. Lack of information will likely result in delays or an inability to process your order. Identifying information about the SAGE content you wish to reuse, including the ISSN, DOI, title, authors, volume, issue, and page numbers. The way you wish to reuse the content and what rights you will require, including languages, formats, territories, and the expected print run/number of readers. 3. Please allow sufficient time for processing your request. If the request cannot immediately be approved through RightsLink®, depending on the nature of your request and content requested, it may take up to four weeks to process your permission request. 1. 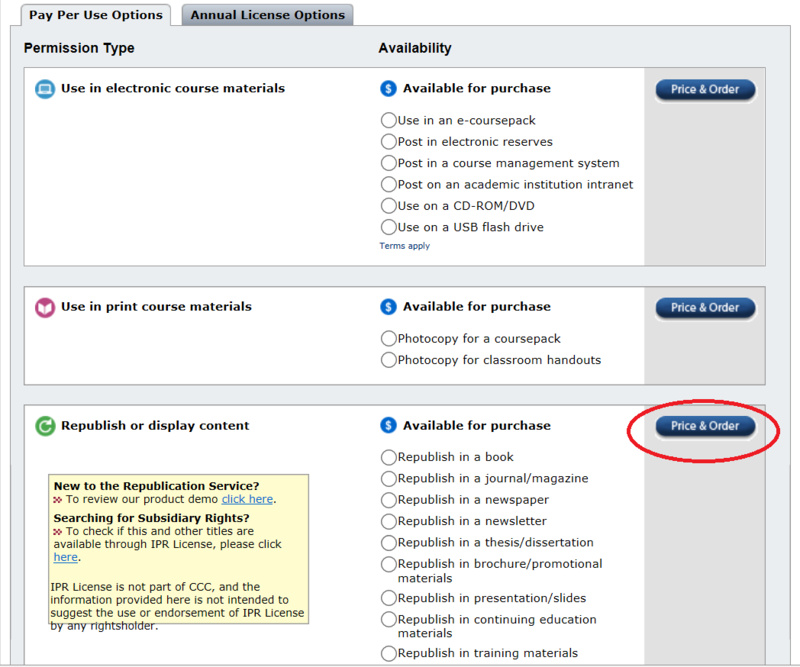 Locate the article you wish to reuse on the SAGE Journals website. 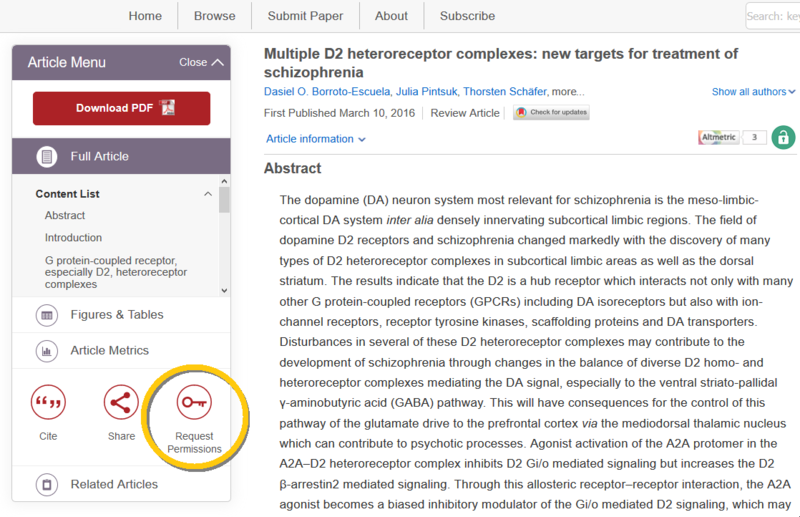 Once the desired article has been located, click on the ‘Request Permissions’ link (indicated by the key icon) beneath or to the left hand side of the relevant article. This link will automatically redirect you to the RightsLink® page for the article. On the RightsLink® page, select the option that best describes your use. 4. Enter the details regarding the use to receive a price quote. You will need to create a RightsLink® account to complete your request. Please be sure to read and accept the Terms and Conditions of the permissions grant prior to completing your request. If you are unable to locate the title or otherwise complete your request on RightsLink®, request permission from the Copyright Clearance Center at www.copyright.com. 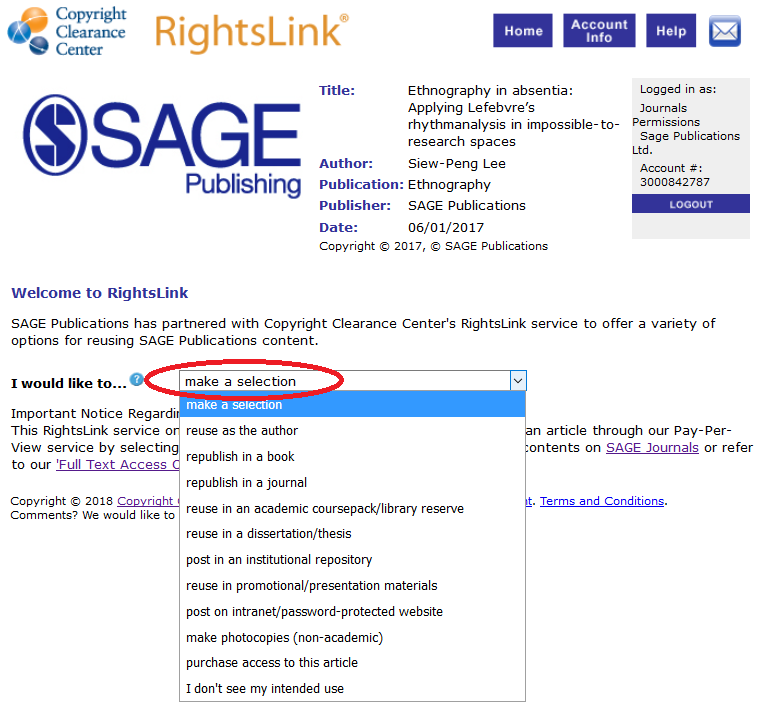 Search for the SAGE journal you wish to reuse by ISSN or Title on www.copyright.com. Once the desired title has been selected, select the intended use from the options provided and click 'Price & Order'. If you are still unable to secure permission or have further questions, email us at permissions@sagepub.com for SAGE Publications, Inc. related inquiries, or email permissions@sagepub.co.uk for SAGE Publications Ltd. or any other related inquiries. Please review the Tips for a Successful Permissions Request at the top of this page to determine the information you should include with your request. Allow up to four weeks to process your request.